Many a times we download movies, music files,etc. and we are not able to watch it while it’s on the download mode. Suppose the movie size is around 2 GB, & you have completed downloading over 1 GB of that 2 GB. So, in general sense you can watch it till the interval as half of your movie has been downloaded. But technically you won’t be able to watch it on popular media players like VLC (Video LAN Codec/Player), Media Player classic or any other media player. The reason behind this is that, the movie is downloaded into many pieces. So a 50% Complete movie doesn’t mean that you can watch till the interval time. Even the first half has some parts which is still not downloaded. VLC will try to repair the AVI Index, but still it will have errors while playing. To Solve this problem you’ve two options with you viz – Virtual Dub & DivFix++. 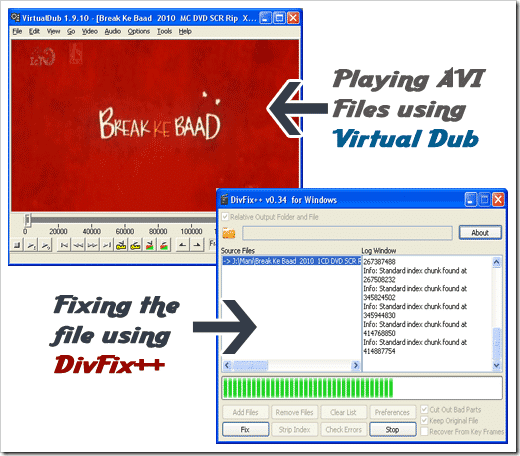 Virtual Dub will directly play the file you choose rather than trying to fix it at first. It fixes/cuts the incomplete parts thereby allowing you to watch the video smoothly. DivFix++ on the other hand tries to fix the AVI Index first thereby cutting out the Bad parts & keeping the original file. 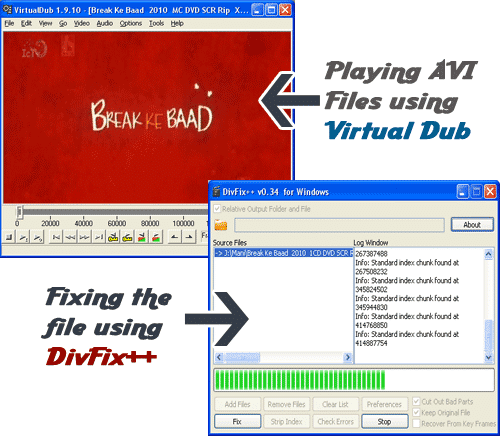 Check the above image to get a glimpse of the what both Virtual Dub & DivFix++ do & what is the difference between them. Make sure that you are importing an AVI file in both the Softwares. Though Virtual Dub even supports .mpeg, .divx, .mpg, etc. But DivFix++ specifically requires .AVI format. Below are the download links to both the Softwares. You can Subscribe to Our RSS Feeds / Daily Updates if you liked this post & it helped you to watch Incomplete AVI files. Have you tried some other Softwares which have similar functions/better functions than both of them ?? Very good tutorial bro.I like the way this has been crafted. Keep up the great work. thanks for sharing this mate. this really helps most of the times i have faced this problems. i will surely try it…. VLC will play a portion of the file, especially if the first few chunks are downloaded, but when it comes to an incomplete/missing chunk, it stops playing. Using the eMule plugin, I can view the downloaded pieces sequentially, without VLC crashing. Unfortunately,it only does this for eMule. Hmm i also faced the same problem a few months ago. I will surely keep your post in mind. Great work. Wow, these two software are great! Sometimes the movies that I downloaded are incomplete and I have no choice but to delete them and re-download. Now, I have found a solution to this! Superb. My VLC already plays .part files from the eDonkey network, though I haven’t tried .bt! or other extensions. My guess is that the extension is arbitrary, but it’s possible that VLC only recognizes certain extensions as “partial file” type.